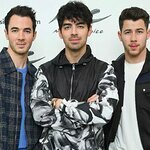 The Jonas Brothers will play a special charity game of kickball in Arizona prior to their concert in Glendale on August 11. The boys will take on 104.7 KISS FM deejays Johnjay and Rich in the game, to be held at the Peoria Sports Complex to raise money for Johnjay and Rich’s Christmas Wish program and their Care For Kids Foundation. Entrance is free, but you can bid on the chance to play in Johnjay and Rich’s team by clicking here. Raffle tickets for autographed Jonas Brothers memorabilia, meet and greets and party passes will be $5 for one or $10 for three.